There’s nothing much that can brighten my day more than snapping up a few eBay bargains for a snippet of their retail value. Over the past few weeks, I’ve been lucky enough to find a few items that have taken my fancy. Sometimes, I find eBay can be a little bizarre… the things people sell! Most of the time, it’s people like you and me, thrifters, trying to raise a few extra pounds selling good quality, sometimes quirky, clothing. Don’t get me wrong, you have to sift through a lot of rubbish to find a diamond in the rough, but it can be worth your while. I wanted these the moment they came into Topshop. I had these the moment they came into Topshop. It’s just the size I had, didn’t match up to my body, darn thighs. And now, these beauts officially belong to me in the correct size. Yes! I’m intending to pair these with a denim/chambray shirt, some chunky heeled boots and opaque tights. And for a change, a statement collar. What do you think? What’s not to love about a tea dress? They’re so versatile! Team with boots and a biker and you’re ready for a gig, or with heels and a dress coat and you’re good for tea with the in-laws! Although, I already have a tea dress (or 3, totes normal right?) there’s always room for more. As soon as I opened the packaging, I knew that this would look gorgeous with burgundy tights, plum lipstick and a victory roll. My other half is always telling me I dress too conservatively for work. Maybe I do, maybe I don’t. I’m a teacher, so I always think I need to tame my Zooey Deschanel loving ways and think sensible. Anyhow, I’ve been wanting a shift dress to layer with cute shirts for work for agesss and this Romwe dress may be the solution. It’s perfect! The material is so thick, it feels like felt! What’s even better is that most shirts work well underneath. When I think of shirts, I think lady ties! Have you seen Flapper ties? Made by the very talented flappergirl? A perfect way to add kitsch to an outfit, although maybe too much for school. I love love love these lady ties and, after Christmas, I will be splurging on one…the chevron one, if you were wondering. I’m no natural infront of the camera, and this was the best I could do. Despite my face, urgh what illness does to you, I had to show you the dress full length! My Primark scallop collar blouse can now see the light of day again! 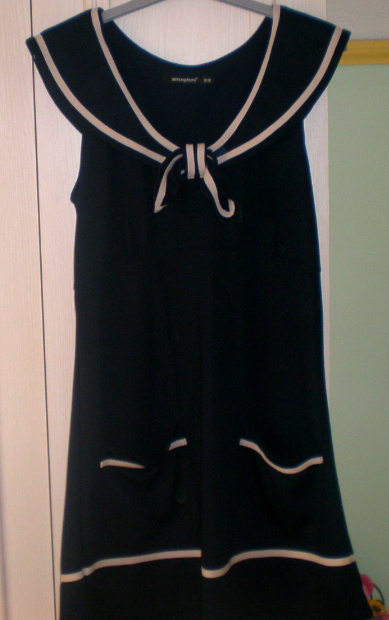 Many years ago, a few, I had the *most* perfect sailor dress from Topshop. It was black with a micro spot polka dot. I wore it a couple of times for nights out, until my mother uttered those fateful words, “that again?” and my sailor dress was eBayed, never to see the light of my day again. So, you can imagine my joy at finding this similar version late last night on eBay. A little steep on postage and packaging, but I think the sale price evens that out. I’m going to wear it with a bright red cardigan and mustard tights! Let’s just hope it fits! For the past week, I’ve been quite poorly. Cue many hours spent on the sofa watching countless reruns whilst drifting in and out of sleep, trying to force down as much water as possible and eating a liquidised diet. You should have seen my tonsils…bleurgh. On the brighter side, I’m now back to my usual self and actually looking forward to going back to work and being able to write and blog a little more! What have you been buying in the run up to Christmas? Do you dabble in eBay clothing? What’s your best find?